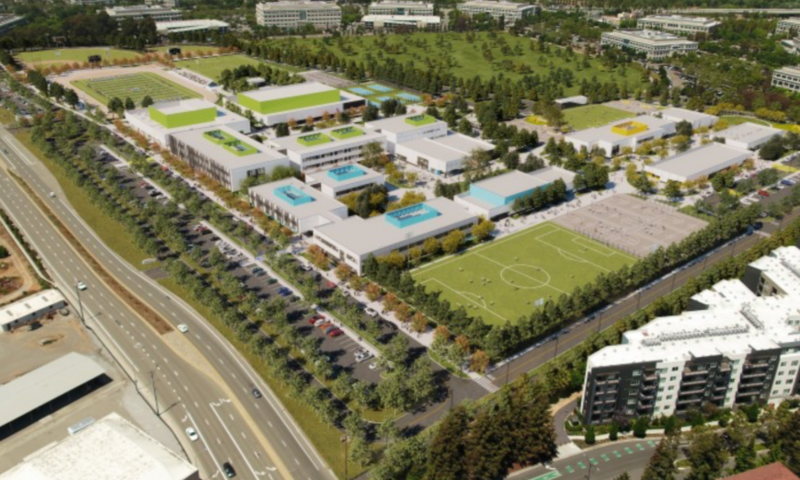 The Santa Clara Unified School District (SCUSD) has been working on development plans for new facilities at the Agnews Campus located at 3500 Zanker Road in San Jose for the past decade. The longterm effort to design a new elementary school for 600 students, a 1,000-student middle school and high school with capacity for 1,600 students on a 55-acre site, recently paid off. It’s been announced that the Agnews K12 project will receive an Award of Honor in February for Project in Design by the Coalition for Adequate School Housing (CASH) as part of the American Institute of Architects, California Council Leroy F. Greene Design & Planning Awards Program. According to Adams the recognition by CASH is in large part due to the project’s emphasis on environmental sustainability. SCUSD followed sustainability guidelines set by the Collaboration for High Performance Schools, an organization that advocates for energy efficiency, good storm water management and ensuring that educational buildings relate to the surrounding environment. The Agnews Campus design is also state-of-the-art in that it’s preconfigured to be net-zero if future funding allows, meaning that the buildings can potentially generate all the energy that is consumed. The campus design focuses on an “ethos of stewardship” by conserving existing open space through high density development. The campus facilities will be constructed in close proximity to one another with strong mobility connections within a context of many acres of grasslands and wooded areas. Mature Oak and Sycamore trees will be preserved to help retain the link to the site’s history, which was marked by the presence of a mental institution. Designed by LPA Architects, the facilities were designed in a way to accord with SCUSD’s educational objectives. The design provides spaces for student collaboration, teamwork and teacher collaboration in addition to traditional classroom spaces. There’s more of an emphasis on student-directed education Adams said. Building construction hasn’t yet begun, however site improvement work is already underway. It’s expected that the elementary and middle schools will be complete by August 2020 and the high school will be ready by August 2022. With both Wilcox and Santa Clara High Schools over capacity, some students are in modular classrooms on those campuses. The plan is for students to remain in their current locations until the Agnews Campus is ready for occupancy. SCUSD’s bond project manager, Rosiella Defensor, will accept the award at CASH’s office in Sacramento on Feb. 20. The project will also be recognized at the organization’s largest event, the 40th Annual Conference on School Facilities, expected to draw more than 1,500 school facilities professionals to the Sacramento Convention Center from Feb. 25 to 27.